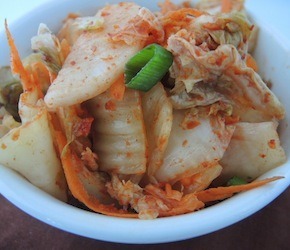 Quarter the heads of cabbage and cut into 2 inch pieces, toss the cabbage with the salt, chili powder, daikon, carrots, green onions, and garlic. Pack the cabbage into mason jars until almost full, placing a piece of the reserved nappa leaves on the top, screw the lids on loosely, and let sit for 3-7 days. Note: The cabbage will release a lot of water during the next few days, I recommend putting the jars on a plate to catch the liquid that will be released.